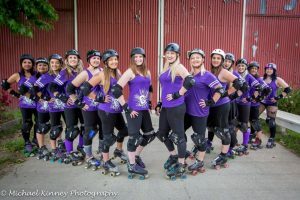 Cal Skate Roller Derby (CSRD) has a body-positive attitude and approach to training in order to help women see their true potential and athletic ability. These women bring a new meaning to female empowerment, becoming a coalition of women with a passion for roller derby and what the sport represents. Founded in 2010, Cal Skate Roller Derby is an all-women’s, skater-operated, flat track roller derby league from Santa Maria, California. They are strong, devoted, do-it-yourself women from all walks of life. This league prides itself in upholding the integrity of roller derby as a real sport, as well as providing entertainment for the public. This organization’s members strive to be positive roll-models in our community. Click Here for more information on tickets, upcoming bouts, or joining the squad!